Same old same old politics in San Diego. The “Big Boys” have to get their way. They want us to vote “No” in opposition to a plan that was created to make a community healthy and safe. The truth is dozens of facilities, just like Master Plating, still exist today in Barrio Logan and they are grandfathered in and allowed to stay but “new” polluters would not be allowed in the newly established residential zones. Over time, implementation of the “Community Plan Update” will transform the neighborhood, improve children’s health and create new jobs. This would break a 35 year history of toxic land-use planning that allowed houses, parks and schools to intermingle with polluting industrial properties. If the plan passes on June 3rd, it will finally separate industrial establishments and residential neighborhoods in the interest of breathable air, affordable community housing and support for the maritime workforce. This article is just wrong. Developers want to build condos and retail next to the shipyards, that is what a yes vote is in favor of. The shipyards correctly fear that if new condos or retail goes in, then they will soon be forced out. The shipyards are correct. Check out the Del Webb case that went to Supreme Court. Del Webb built homes next to an existing cement plant in AZ. Then sued to shut down the plant because it was noisy and dusty. Del Webb won and the cement plant closed. The shipyards are also noisy and dusty. But shipyards have great jobs, and the Navy uses them. We in San Diego lose a lot if the shipyards leave. We lose only a little, if we have a few less condos. Vote No ! The shipyards are going nowhere. Do you realize the power they have in this city? The current plan from 1978 allows developments in Barrio Logan. The plan that was adopted by the city council allows them. The plan the shipyards were in favor of allowed them as well. This issue has nothing to do with developing condos in Barrio Logan. All the plans allow that. This plan and B & C is about creating a buffer zone over time between heavy industry and residents. 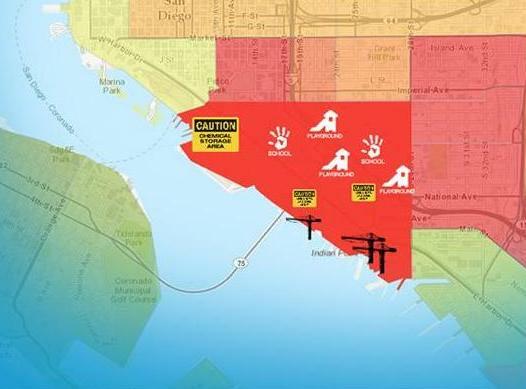 It doesn’t directly affect the shipyards. Those are going nowhere. Joe… the community planning process took over 5 years and $3 million of our taxpayer dollars. The Navy itself came to San Diego and took no position on this – it said that whatever happens in Barrio Logan is not of consequence to its future decisions. The shipyards aren’t leaving, this plan doesn’t ask them to, and on the contrary they’d add up to 5000 jobs because of it. As a matter of fact, they’re thriving right now and nowhere close to shutting down! Don’t believe it? See Gary Robbins’ December 13, 2013 article in the UT on employment soaring at the shipyards. In any case, for anyone who takes the time to understand what’s really happening here, there’s no alternative but voting Yes on Props. B & C. At the end of the day it’s what the community wants, and it came through a textbook compromise with all stakeholders. Superior Court judge ruled that Shipyard Repair Association violated the state code with misleading claims and voter petitions. Yet these guys continue to lie: Sanders, Faulconer, John Alvarado, Shipyard Repair Association. Joe S. the shipyards are diverting your attention as planned. The shipyards are’t going anywhere. Jobs will not be lost and the economy will not fail due to the Community Plan that Proposition B & C support. The one block buffer zone will seperate industry from residential zoning. Shipyards reject B & C because they want to continue to expand into areas where there are already homes. 60% or more of the residents have been pushed out since the 1960’s when industry was allowed in. In the 1920’s this was one of the few places were people of color were zoned to live in. Corporate bullying and lobbying should stop.